This skiff was designed by Pete Culler in 1976 for our neighbor, Anne Bray. The boat is intended to serve as a tender for the Brays' summer camp on a rocky island, here in Maine. The rudder and centerboard have been kept shoal, to preserve the boat's ability to tiptoe in around the rocks and ledges without touching bottom. The rudder looks too shallow, but it is expected to "swim lower" when underway. It is hung in the manner of the English beach boats, with a very long lower pintle, which looks wrong end to, making it easy to ship or trice up, when landing. It is hoped that it will rise up if it hits an obstruction. The pintles and gudgeons are intended to be very stong, since of necessity they must be mounted unusually close together. • The planking reduced from Vi inch to Y% inch and using four laps instead of three. • The frames of cedar instead of oak but spaced 2 inches or 3 inches closer together. • The bottom planks made thinner, % inch instead of 3A inch and their seams splined. • Except for the chines, all else that was normally made of oak could be made of cedar. It would be difficult to imagine a handier, more versatile boat for working the shore and beachcombing. She should be a joy to row or sail, and will be an eye-catcher wherever she goes. 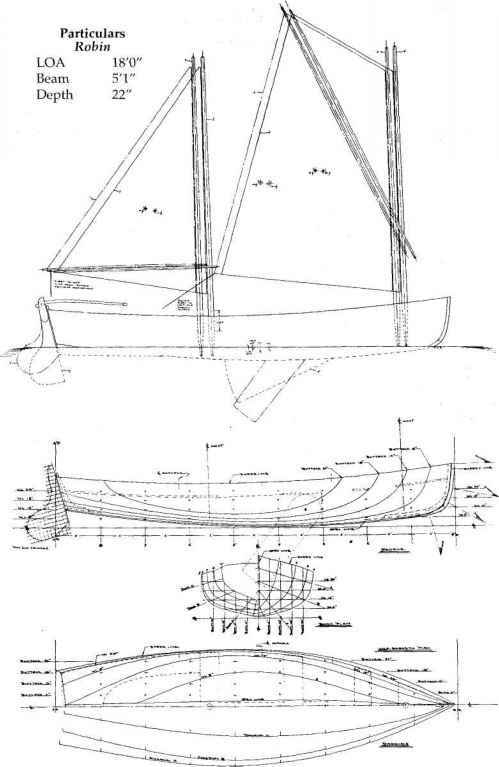 Plans for the 17-foot Culler skiff are available from George B. Kelley, 20 Lookout Ln., Hyannis, MA 02601; 508-775-2679. IT and a depth of 22 inches amidships. She is an »-open boat, arranged with three rowing positions and a ketch rig for sailing. The mainsail is rigged with a diagonal sprit, and the mizzen with a horizon-til sprit. There are no headsails. Robin was designed in 1975 by Rob Pittaway for Nat French of Westport, Massachusetts, and she was built in 1976-78 by his stepson Steve Goodale. The concept was for a boat that two people could use for coastal cruising under sail or oars, yet be small enough to be trailered. Two of the prime requirements were that she he able to carry quite a lot of weight and be reason-•ih!y stable when beached. That led to this full but easy shape and the plank keel. Robin has proved to be a fast, able boat under sail and oars, with or without a large load of people. She spends her time between Penobscot Bay, Alamoosook lake in Bucksport, Maine, and Westport Point, Massachusetts, serving well in each location. T should admit up front to having lusted after the I Buzzards Bay Sloop for years. How could I not J. want this boat? With every subtle curve and detail, her hull demonstrates Pete Culler's gift for proportion and his sense of appropriate decoration. "Such a boat," Howland said, "would have to be attractive to look at and shipshape in appearance. She would have to be well built with special attention to detail. For a number of reasons, wood seemed to be the best and only medium for construction. Wood has natural virtues so far as appearance, sound, feel, smell, and flotation are concerned. Variations and modifications by [the boat's] owner are easy. And [wood] can be painted, polished, and puttered with. In short, it canbe loved." During their search for an appropriate model, Howland and his fellow conspirators talked about Scituate lobsterboats, Connecticut River shad boats, and Bahama dinghies. 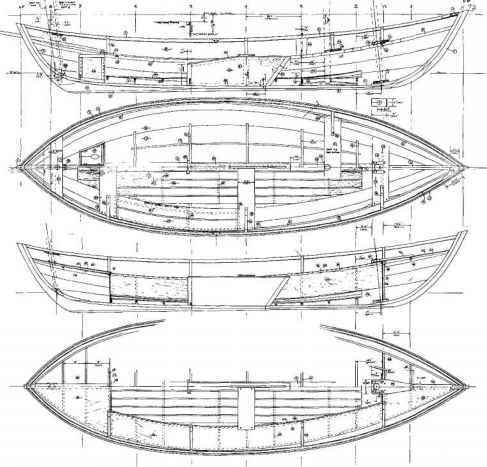 All having been said, Culler kept a Kingston lobsteiboat firmly in mind while drawing the hull lines for Concordia's daysailer. Although Burke's book bristles with accounts of the Sloop Boat's ability in a breeze of wind, this is a light and narrow craft that carries a healthy spread of canvas. It can jump up and bite a sailor who dismisses the mainsail's deep reefs as mere affectations. For all its virtues, stability and power are not the Sloop Boat's strong suits. 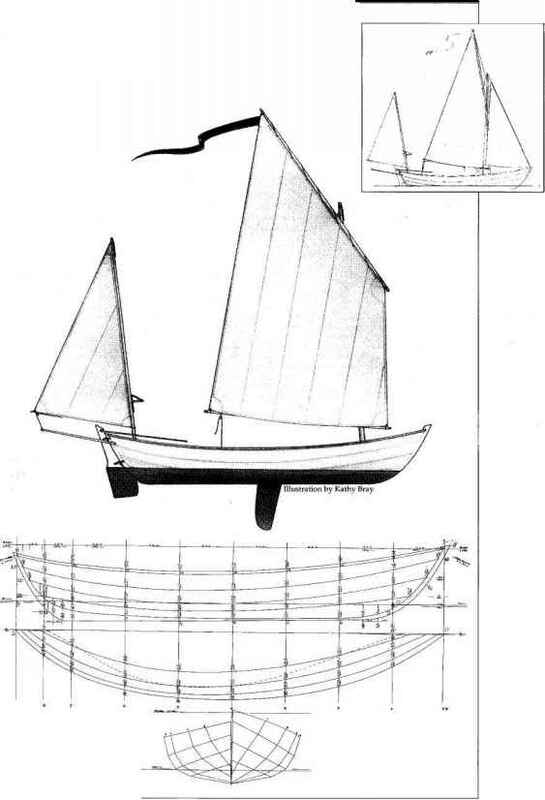 In 1977, Wyatt Garfield asked Culler to draw him a more able version of this design for sailing off the exposed shores of Cuttyhunk Island. Captain Pete stretched the hull to 18 feet 8 inches, made it 1 foot wider, added 6 inches to the draft, cranked some dead-rise out of the bottom, and included 700 pounds of outside ballast for good measure. He increased the sail area sparingly. He swept up the sheer back aft. (So far as I know, nobody ever accused the old Sloop Boat of dragging its tail; but, with a lazy helmsman loafing against the transom, the little boat appeared to be perpetually climbing uphill.) Lapstrake planking replaced the smooth set work specified for the original design. Shadows cast at the laps would accentuate the new hull's sweet lines. The gains in stability and power provided by these changes might surprise a casual observer until he remembers that "size" increases essentially as the cube of a hull's length. Of course, the unseen lead ballast adds considerable inertia to the equation and stability to the boat. dimensional sheer appearing to powderhorn (take on a reverse or S curve forward) in the finished hull — no matter from what angle it might be viewed. 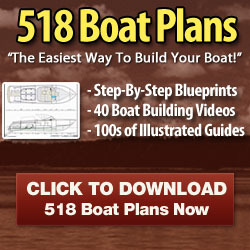 Most boatbuilders consider the above modifications to constitute "builder's prerogative." Some designers will disagree. That's the way it is. When the folks at The Landing School asked if I'd like to sail one of their Buzzards Bay Sloops, they didn't have to wait long for a reply. I drove up to Kennebunkport on an October Indian-summer afternoon. The sun was warm, the air crisp, and the visibility stretched far beyond the limits of middle-aged eyesight — a day to pull from my mind's closet in the dead of this winter. I found the sloop resting in a borrowed slip at the local yacht club. The low autumn sun reflected from white topsides and mirrored the lapped planks on the water. Oiled teak decks and rails glowed like honey in a glass jar. Oh, my. Once aboard, I was surrounded by comfortably shaped details. From the steam-bent coaming and slatted benches to the carefully tapered spars, this boat bespoke first-class professional quality. Never mind that she was built as a learning experience. Looking forward from the helm, my eyes followed the ever-tightening arches formed by closely spaced bent frames. They define the hull's shape. Of course, most of the frames are redundant in this glued lapstrake hull. Landing's president John Burgess explains that they were included for their "educational value." Yes, and I'll wager that the students had grand fun bending them in, too. throat and peak halyards for the mainsail, a jib halyard, too-tight reef lines, etc. While the sloop is underway, the halyards' falls hang neatly from belaying pins at the turn of the coaming up forward. They look right, and they come easily to hand — a fortunate arrangement on this day as the new three-strand running rigging stretched as if made from rubber. We reached off under a moderate breeze to the good sound of a lapstrake hull cutting through waves. (Lapstrake boats don't make noise. They make sound, lots of sound, pleasant sound.) The sloop's fine forefoot blends smoothly into flaring topsides to produce a smart bow. This boat understands that she should brush aside small waves but climb over the tall ones. Her motion is easy and comforting. The helm is light but firm. Culler's sloop wants to keep to its heading, although not to the point of being stubborn. Nudge the tiller, and the boat will change course smoothly — almost imperceptibly. She is certain, but stately, in stays. I'd not want to drive her into a tacking duel with, say, a Herreshoff 12'/2-footer. If you're accustomed to sailing light centerboarders with big rudders, you'll be able to send out for lunch while putting the sloop about. The low gaff-headed rig suits this boat aesthetically and functionally. While looking at Culler's drawings, we might wish he had peaked up the gaff just a wee bit to preclude its sloughing off to leeward. But, out on the water, it works fine just as drawn. The gaff's relatively short length, an efficient angle of pull for the peak halyard (allowed by a mast that extends well above the height of the gaff jaws), and a good angle to the mainsail's leech combine to keep the gaff where it ought to be. The total joy of sailing any boat comes from the sum of a thousand discrete parts — aesthetic and technical. Aboard the Buzzards Bay Sloop, everything adds up perfectly; and she's almost as much fun to watch go as to sail. This was Captain Pete's last design. It might well have been his best. Plans for the Buzzards Bay Sloop and other Pete Culler designs are available from George B. Kelley, 20 Lookout Ln., Hyannis, MA 02601. Along time ago, I cruised the Chesapeake in a 15-foot peapod. A typical summer's day would unfold in no particular hurry: Up at first light (more or less) after having slept on the beach; take a short and slow walk along the waterfront, drag the stranded boat down to the water, stow the meager camping gear, and row off into the morning calm. Breakfast about a mile offshore, safe from at least some of the biting insects; row on until the climbing sun makes the effort uncomfortable (usually about 10 a.m.); go ashore and find a proper shade tree under which to doze until lunch (the insects have disappeared in the heat of a dry day). At the first sign of the afternoon Seabreeze (some time between 12:30 and 1:30) set up the unstayed lug rig and sail to wherever. In the evening, when the thermal fades, strike the rig, and pull the last mile or so to a secluded cove. Such are the simple delights of beach cruising. 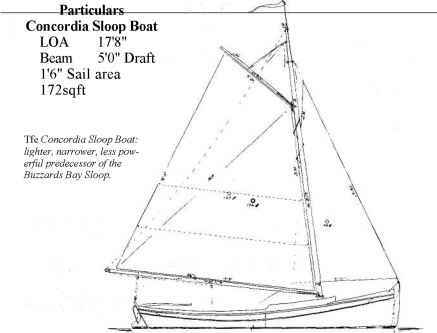 The design shown here, Iain Oughtred's 19-foot 6-inch Caledonia Yawl, will make an excellent beach cruiser. It will be faster under sail and will carry more gear than my peapod (though we can be certain that the old pod will be easier to row and less of a challenge to horse around the beach). Oughtred, known for applying an artist's touch to his light lapstrake creations, admits to being under the influence of Shetland ness yoles and sixerns while drawing this handsome double-ender. And those highly regarded workboats can trace their pedigree to older Norwegian small craft — a strong heritage. The Caledonia has relatively high ends and shows considerable reserve buoyancy above the waterline throughout her length. Her hull lines resemble those of many surfboats that have evolved to meet the rigors of working off exposed beaches on different continents. (Similarities between the world's beach boats often are more striking than regional idiosyncrasies.) This yawl has well-balanced ends. Oughtred gave her a run that is finer and shows more deadrise than might be ideal for extremely high speed under sail. The resulting gains in helm balance and civilized behavior in waves make the compromise profitable. 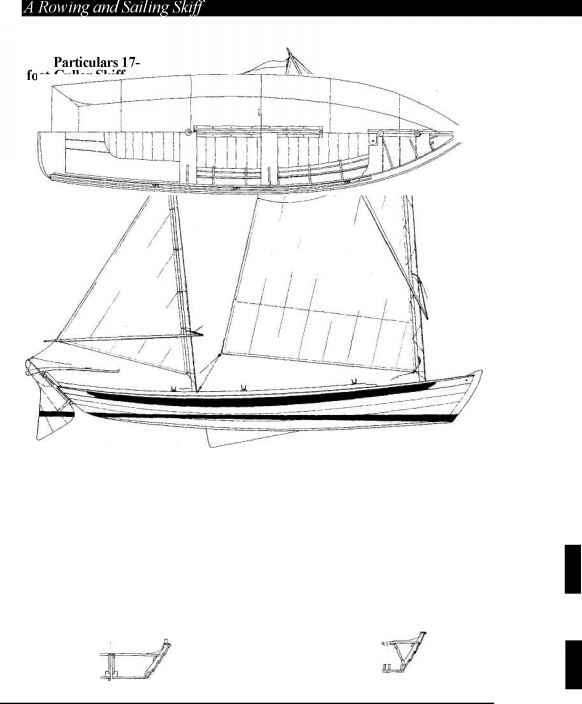 Caledonia's builders can rig their boats with either balanced lug or high-peaked gaff-headed mainsails. The balanced lug has the advantage of being self-vang-ing, and it sets on an unstayed mast. Less time will be required to raise and strike the lug rig — good news, as beach cruising often involves repeating the exercise four or five times every day. The control and balance provided by the tiny (33-square foot) leg-o'-mutton mizzen probably pay for its cost — and for the complication it introduces into the steering equation. The mizzen will almost always be the first sail set. It will keep the yawl squarely into the wind while you fuss about stowing the lunch and setting the mainsail. To assure positive tacking, simply back the mizzen to the inside of the turn as you come about (this boat shouldn't need help often). When you're ready to eat lunch, strap the mizzen in hard, and drop the main (lugsails come down as fast as lead balloons). In this configuration, Caledonia will sit quietly during most summer weather. At the end of the day, if you're of a mind to show off, the mizzen can be used to back the boat down under sail into a slip. Just be sure to remember the boomkin, and keep the mainsheet free to run; if it fouls, you'll be courting disaster of front-page proportions. The steering difficulty caused by the far-aft location of the mizzen is obvious — the tiller wants to cut clean through the mast. Oughtred could have solved the problem by specifying a fancy curved tiller, or by drawing an inboard rudder with its post forward of the mast, or by using a yoke and lines. He chose the simplest solution: a push/pull tiller. A short tiller arm (half a yoke, if you will) attaches to the rudderhead perpendicular to the centerline. A long, light tiller is hinged to the shorter stick and run forward. As drawn here, pulling the tiller forward will turn the boat to starboard. Some practice in open water will suffice to get the technique under control. On your first day with the boat, you might want to row out of the harbor. For serious shallow-water sailing, Oughtred chose a pivoting centerboard in preference to a daggerboard. This arrangement requires a longer trunk, but the boat has room to spare. A rowing thwart supports the trunk solidly. Caledonia's lapstrake construction makes good use of plywood and epoxy. The hull is built in an inverted position, and the backbone and building jig are fairly conventional. Four wide strakes for each side are spiled, hung over temporary molds, and beveled. Drywall screws can act as clamps until the epoxy sets. Solid timber shouldn't be used for planking this boat, even if you're fortunate enough to find boards of appropriate width. Lack of cross-grain strength makes it prone to splitting — especially along the laps. Solid planking works fine for similar designs, but here there are subtle differences in shape and considerable differences in framing. Find the best mahogany marine plywood you can, and go to it. Oughtred's yawl is well worth the expense. The plans specify Ys-inch planking for Caledonia's sides and bottom. Her frameless hull will be strong and stiff, but it's well to remember that plywood's outer surface — no matter how thick the sheet — consists of one extremely thin layer of veneer. You might consider adding hardwood beaching strips, one on each side, at the first lap just below the turn of the bilge. They needn't be too long. Three or four feet of length should do — just enough to catch the fullness of her hull as she lies on the beach. As for accommodations, Oughtred shows a version with considerable built-in closed space (similar to a Drascombe Lugger's interior) and a more open model. The open boat will be simpler and lighter — and for beach cruisers, light is good. Builders can choose various combinations of the two layouts. In all cases, the decks are kept below the rails. This arrangement gives better access to the yawl's ends, and it permits secure on-deck stowage of light gear. Also, the sunken decks allow our eyes to follow the full, unbroken sweep of the sheer from stem to stern. I can't look at this boat without wanting to push her into the surf and take off. 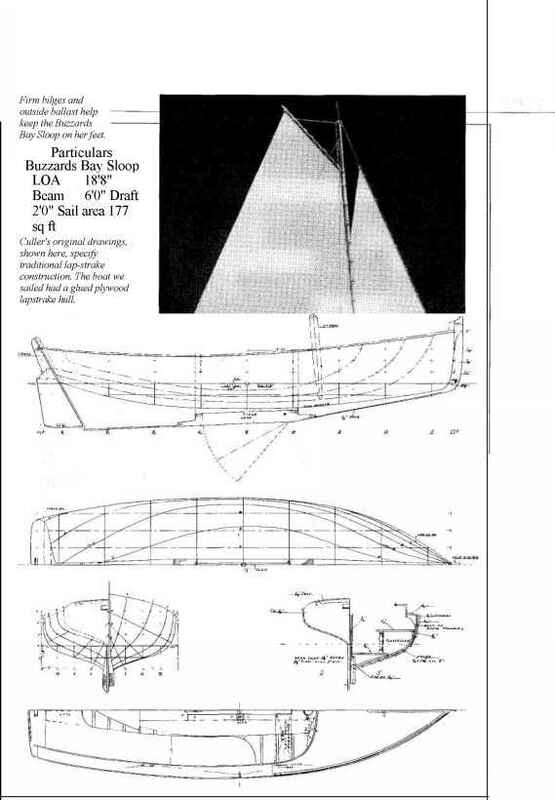 Plans for the Caledonia Yawl can be obtained from The WoodenBoat Store, P.O. Box 78, Brooklin, ME 04616; 800-273-7447. Iain Oughtred can be reached at Altyre Stables, Forres, Moray IV36 OSH, Scotland. Caledonia can be rigged with either a balanced lug (below) or a high-peaked, gaff-headed mainsail (right). Caledonia's hull lines reveal her Norwegian ancestry. Builders can choose a simple, open interior (top), a model with built-in furniture (bottom), or a combination of both arrangements.